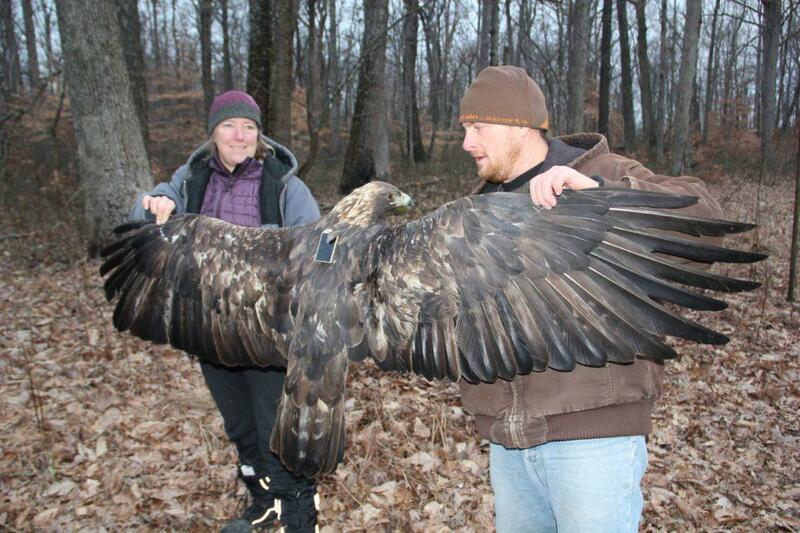 For the last four years, Bernheim has been tracking a golden eagle named Harper. He's one of about eight to 10 eagles that show up to winter among the more than 25-square miles of forest that make up the arboretum, said Mark Wourms, Bernheim’s executive director. Golden eagles are pretty rare in the eastern United States. In Bernheim, they generally show up for about 12 to 14 weeks in the winter when the nesting population migrates south from Canada, Wourms said. The eagles are a sign of a healthy forest. Their presence positively impacts all the wildlife that reside there, he said. Harper used to cruise the skies solo, but in the last couple years, he’s been palling around with a companion. Recently, Bernheim decided to catch and tag a second eagle. So ornithologists set up a roadkill deer carcass on a knob out among the forest. The team lied in wait as an eagle landed near the carcass. But then, a pair of golden eagles swooped down – with their seven-foot wingspans – and knocked the intruder off its perch, driving it out of the area. "We now know it was Harper and this female that did that," Wourms said. Afterwards, the ornithologists caught and tagged the female as she settled down to dine on her prize. Mike Lanzone and Dr. Tricia Miller, hold up the golden eagle. The female weighs in at 12 pounds with a crest of golden feathers on the crown of her head and a piercing gaze. The team outfitted her with a solar-powered GPS satellite transmitter — just like Harper's. From the sounds of it, the pair are getting along just fine. "These two golden eagles are spending time together," said Andrew Berry, Bernheim's forest manager. "From the transmitter signals we can tell they are roosting and flying together. We have also observed them in the field and on trail cameras together." Golden eagles are thought to mate for life, but it's not clear if the pair will migrate north to nest and breed. If they do, Wourms said that would be an extraordinary opportunity and possibly, the first pair of golden eagles tracked together in the eastern United States. "The data collected and the knowledge we gain will be fundamental to the preservation and protection of this species," said Wourms. The eagles are expected to remain at Bernheim through early March. In the meantime, the arboretum is asking the public to help name the female eagle. You can cast your vote for one of three names on the website through Wednesday February 13. A team of researchers at Eastern Kentucky University is leading an ongoing study of copperhead snakes in Red River Gorge. The goal is to learn more about the snakes and minimize their interaction with the tourists.